The diagram shows the part of the curve for . 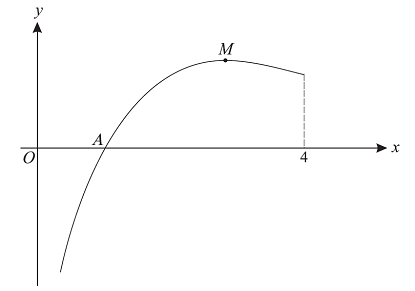 The curve cuts the x-axis at A and its maximum point is M.
i. Write down the coordinates of A.
ii. Show that the x-coordinate of M is e, and write down the y-coordinate of M in terms of e.
iii. Find the x-coordinate of M.
v. State, with a reason, whether the trapezium rule gives an under-estimate or an over-estimate of the true value of the integral in part (iii). Hence, coordinates of point A are (1,0). Since point M is maximum point, therefore, it is stationary point of the curve and, hence, gradient of the curve at point M must ZERO. We can find expression for gradient of the curve at point M and equate it with ZERO to find the x- coordinate of point M.
Now we need expression for gradient of the curve at point M.
Since point M is a maximum point, the gradient of the curve at this point must be equal to ZERO. Hence, x-coordinate of point M on the curve is e.
To find the y-coordinate of point M on the curve, we substitute value of x-coordinate in equation of the curve. 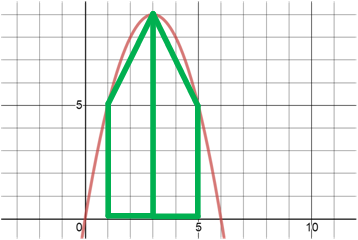 Hence, y-coordinate of the point M is . If the graph is bending downwards over the whole interval from to , then trapezium rule will give an underestimate of the true area. We are given that there are two intervals, . We are also given that and . The given figure shows that the graph is bending downwards over the whole interval , therefore, area found by trapezium rule will give an underestimate of the true area.